That happens to me too.. Last calcareous algae plate that I collected (if that's what it is), though I'm sure it all came from the same bedding surface and I picked up every piece I could find, I could only fit some of them together and there are lots left over! Some details on the concave upper surface (right) of the thallus are visible. There appears to be a washboard-like pattern that matches the folds on the lower side, more or less. Because the details are a bit vague, and the upper sides of these are so rarely exposed, I'm not sure if these features are real or just a chance arrangement of fossil debris or mineralization. The lack of exposed upper sides is probably due to sedimentation and mineralization that locked the surfaces in matrix. This characteristic is frustrating when trying to understand these thalli from top to bottom, but the upside (no pun intended) is that it is useful when determining stratigraphic-up when dealing with loose pieces and slabs. The lack of well-preserved upper (i.e. concave) surfaces may indicate that the plants were preserved mostly -- if not entirely -- intact and in situ. Unfortunately, I was unable to find any descriptions of these strands in the associated text, or anywhere else for that matter. What does the cross-section (side/edge-view) look like? Are those small bumps all over it part of the plant too or something else - epifauna, diagenetic/taphonomic, or just extra matrix not yet removed? I also wonder if that Archeo. reconstruction is supposed to be anywhere near the whole organism or just a small part of it.. The thread like roots look like lichen hyphae. Actually coralline algae in general has growth forms that resemble fungus or lichens much more than plants. They are less than a millimeter thick. I've yet to make out any structural detail. I've wondered about some of them. A number of these thalli, not to mention many Pennsylvanian fossils of the KC area, have a scaly texture that is probably some sort of calcite growth that formed during diagenesis. This scaliness can be quite frustrating when trying to study fossils under the microscope. Probably both, depending on the development of the thallus. So far, I've been unable to make out any thallus attachment points of any of the strands, assuming they were part of the organism. Here is a PDF by Zhuravlev and Wood on Cambrian Reefal Cryptic Communities. There is a photo of thread-like fungal hyphae on the underside of a calcifying algae called Okulitchicyathus discoformus. The time frame is much younger, but it's a good study of biolaminating algal reef ecology. They note that several species exhibit different growth forms in response to different environmental conditions. Here is a PDF by Zhuravlev and Wood on Cambrian Reefal Cryptic Communities. Thanks for the link. The descriptions of cryptic reef communities gives some insight into the epibionts growing on the undersides of the 'pahoeid' thalli. 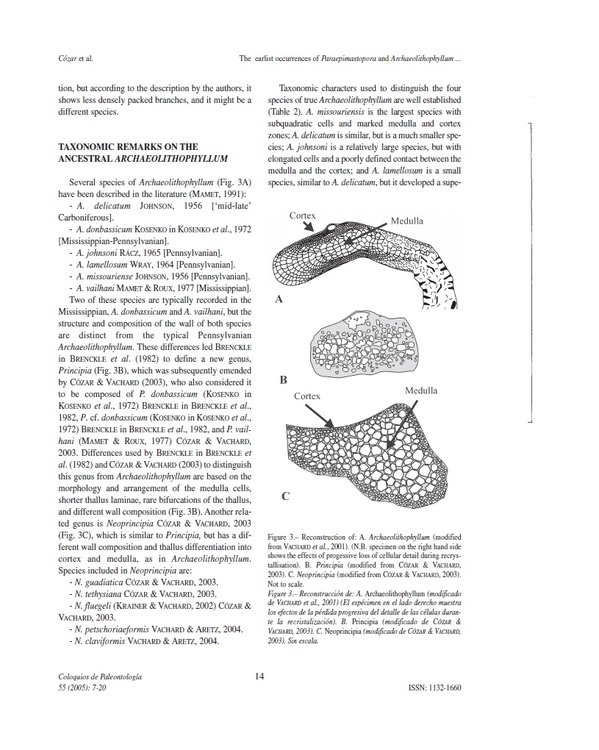 The sparseness of the attached brachiopods and bryozoans, as well as the minute size of the bryozoan (Fistulipora) colonies, indicate a sparseness of the fauna, a very short life of the available growing surfaces (i.e. thalli), or both. Unlike the other strands I've seen, these have a hint of a lobed form similar to some sphinctozoan sponges such as Girtyocoelia or Amblysiphonella. The sparry calcite within the structures indicate voids that had filled with crystals. The strands also appear to be attached to the thallus. For what it's worth, there is a sponge similar to Girtyocoelia that attaches to a host in a similar manner. To be honest, I have no idea what these things are. The green box in the last micro image above highlights a good example of a scaly crust that covers most of the 'pahoeids', as well as many Pennsylvanian fossils in the Kansas City region. I don't know if this is some biological growth (i.e. blue-green algae) or diagenetic mineralization. The tiny solid white tube may be a foram. Eventually, the sediment was cemented before compaction commenced. In the rock surrounding the concretion, the algal layers were reduced to a fraction of their original thickness. These layers of phylloid algae could have been the beginning stage of a reef mound, but it wasn't meant to be. The nascent build-up, which was forming during the marine transgression, was snuffed out at this locality. During the regressive phase later in the cycle, a large mound did form here and to the north. 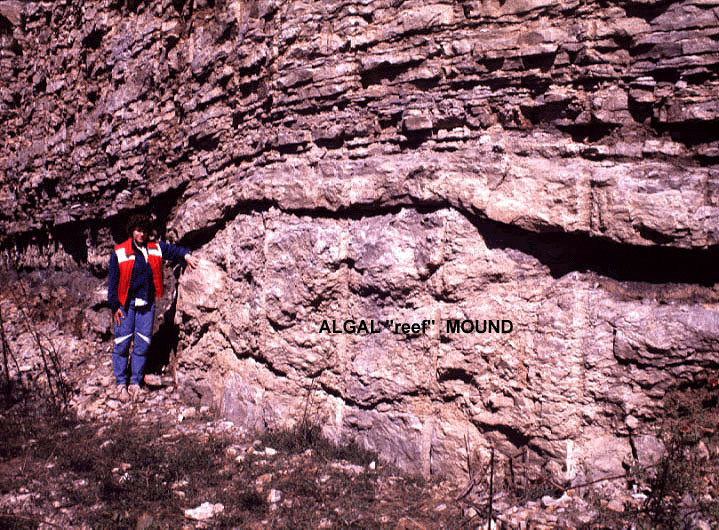 At other localities in subsequent cyclothems, reef mounds formed during both phases. Fascinating would be an understatement! Fascinating indeed. This deposit seems to have taken a unique taphonomic pathway. There are three taphonomic processes that can affect in situ organism once buried: bioturbation, compaction and cementation. Bioturbation - Bioturbation is the reworking of sediment and its contents by the burrowing activity of organisms. This can be highly destructive to delicate remains. The 'pahoeid' beds apparently have endured minimal burrowing activity. If that wasn't the case, the thalli would have been obliterated into many fragments as phylloid algae often is. It is unclear if this preservation was due to a quick burial deep enough to cut off burrowing organisms, sea floor conditions unfavorable to burrowers, or both. The presence of a rich sponge fauna in the shale just above the 'pahoeid' beds may preclude the quick, deep burial explanation. 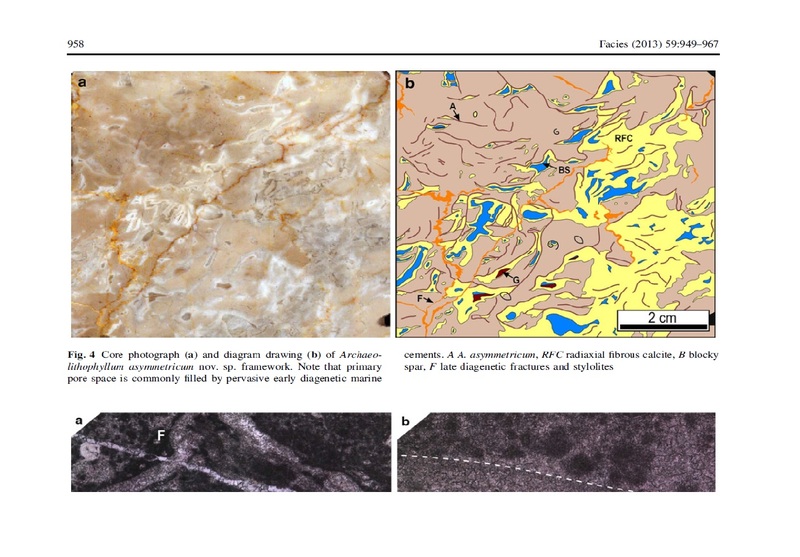 The presence of pyrite and glauconite in the 'pahoeid' beds very well may indicate reducing conditions on the sea floor that could have had an adverse effect on most infaunal life. Compaction - The weight of hundreds -- or perhaps thousands? -- of feet of overlying strata will take their toll. Unless there is early cementation, sediments will be compressed down to a fraction of their original thickness. Cementation - This deposit seems to be a special case. There are the calcitic concretions (i.e. limestone) that preserve the original forms of the thalli. The surrounding beds, on the other hand, are mostly shale with layers of thalli that had been compressed to perhaps a third or so of their original thickness. An intriguing possibility is that the concretions reveal a limestone-forming process frozen in time. 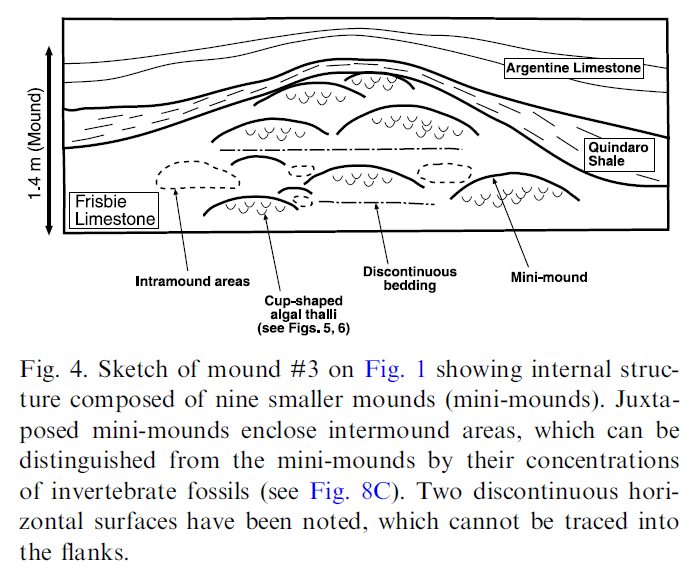 In other words, they may show the early stages of bed formation, where several concretions would grow laterally in size until they coalesce into a single bed. In this case, the process had been terminated before compaction of the sediments had occurred. I have not read anything in the literature about concretion coalescence being widespread in occurrence, but certain beds in the Winterset Limestone (at outcrops in the KC area) strongly indicate such a process. The lithology of the 'pahoeid'-bearing concretions do resemble some of the many algal limestones of the area, more or less. 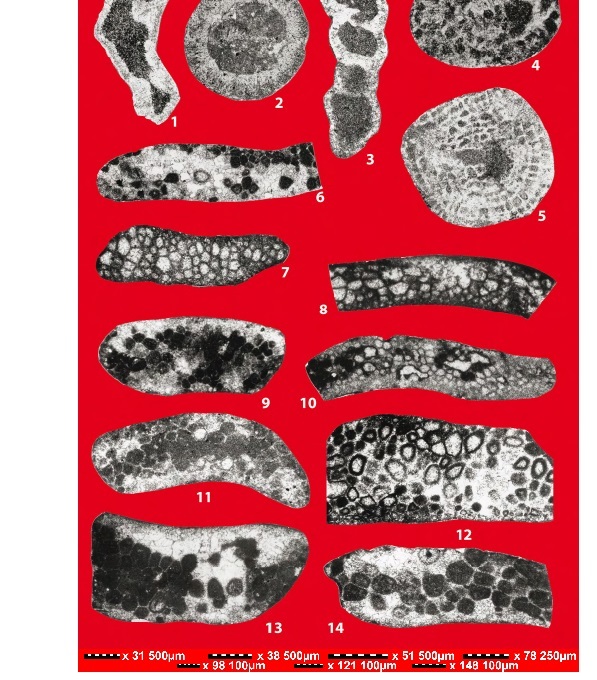 I think there is a very good chance the light-colored, tube-like things shown in the micro-images above could be the problematical fossil Shamovella (S. obscura? ), formerly known as Tubiphytes. In 'Microfacies of Carbonate Rocks' ( http://books.google.com/books?id=dNvnxWJnxtgC&pg=PA569&lpg=PA569&dq=tubiphytes+symbiotic&source=bl&ots=aX9LA5MEsh&sig=I2gJztGxYDfdU90EYYW4IhrpDcY&hl=en&sa=X&ei=aZlIU47UJ4rlyAGwnYDICg&ved=0CCYQ6AEwAA#v=onepage&q=tubiphytes%20symbiotic&f=false ), Tubiphytes is described as "oval, lobate, elongated dark encrusting structures exhibiting a fine irregular web-like network surrounding spar-filled cavities (tubes). The fossil appears dark gray in transmitted light and milky white in direct light. The size of individual elements is commonly up to 1.0 mm but may be greater." "The current interpretation of Paleozoic Shamovella is that it is a symbiotic commensalism of different organisms recorded by the spar-filled 'cavities' and tubes and calcified cyanobacteria represented by the surrounding network (milky 'halos' in my photos)." Also, Tubiphytes lived in a variety of marine habitats and is "commonly associated with Archaeolithoporella (calcareous algae), sponges and bryozoans." Plus, Shamovella is described as being associated with the cup-like alga Calcipatera, which had a similar growth habit as the 'pahoeids'. ( http://www.kgs.ku.edu/Current/2005/sawin/06_comm.html ). 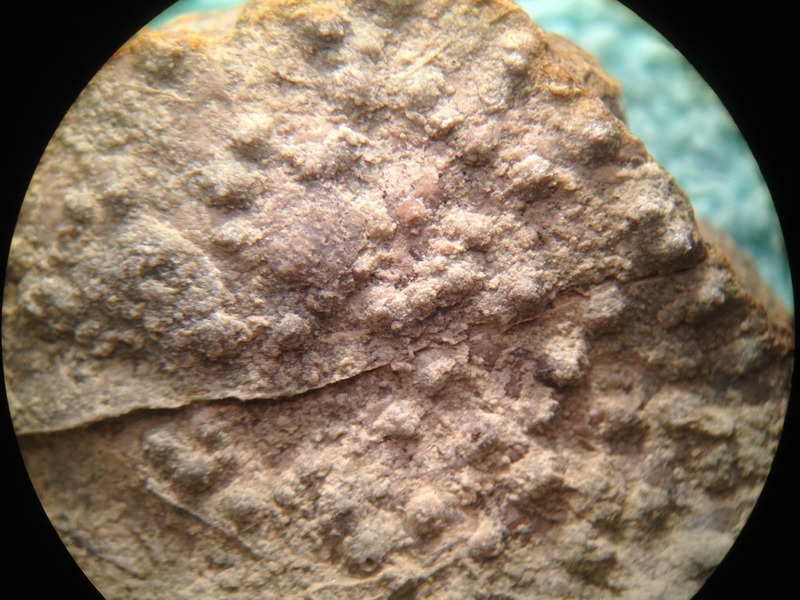 In this Permian deposit, Shamovella is found attached to the thalli and in the substrate below the algae. This is a great book. It is certainly very comprehansive in terms of the morphological variability of Microbial Induced Sedimentary Structures. (MISS). Between the numerous authors of this book (different authors for each chapter) in addition to Noffke's work, including a great paper discussig the differences between MISS and stromatolites have really done a great job describing MISS. However the nomenclature in literature is still very spotty at best. Some of us are working on this as we speak. Very kool fossils. Has anyone yet offered to cut a thin section or SEM on these specmens yet? Remind me of the age again please? No promises but I might be able to assist with this. I have a few colleagues in mind that might be helpful as well. Very kool fossils. Has anyone yet offered to cut a thin section or SEM on these specmens yet? Remind me of the age again please? To be exact, it is late Pennsylvanian (Missourian/Kasimovian). - The thalli appear to be recrystallized, which usually obliterates diagnostic structural details. Some may have preserved details, but there's no way to tell until a section is made. I've been unable to see any details on broken edges. - Specimens most suitable for thin-sectioning should be unweathered. All specimens that show the interesting branching & banded morphology have been exposed to the elements to some degree. - The banded thalli are difficult to identify when in matrix (although there is one specimen that has portions that are both exposed and buried. - I'm unfamiliar with the methods of thin-sectioning. - I don't want to section any that I have so far. Mystery solved.... probably. I finally found some information that closes the gap. Both are most likely similar accumulations of calcareous algae. Even the various lithologies seem to match up.  The thalli (i.e. 'pahoeids') at my site may consists of a flora of various red and green algae. As far as I know, this may be the only known occurrence where the morphological form of the algae are readily discernible. Usually, they are tightly locked away in dense limestone. Wonderful thread. Has opened my eyes to what is possible and I'll be keeping a closer eye on my pennslyvanian limestone which is full of calcareous algae but I've never seen anything preserved like that. Reminds me of my #1 fossil/mineral hunting rule stop to look for the unusual in the usual places. Congrats on the finds and the diligent research! I think the key to the preservation 'style' of the 'pahoeids' is a lack of early marine cementation in the voids beneath the algal thalli. Somehow, the conditions on the sea floor precluded this. Keep looking. At the least, phylloid algae can produce some beautiful-looking rock.